Ladakh Expert – Page 2 – Foremost resource for traveling to Leh-Ladakh. BRO teams from Manali and Kokhsar have managed to clear the road till Rohtang Pass and have met at the top of the pass. If the weather remains favorable and the road is stable, BRO is hopeful of reopening the Rohtang Pass for local vehicular traffic in a couple of days. This would be great news for the locals, who at the moment are forced to cross the pass on foot, risking life and limb while doing so. However, reopening of Rohtang Pass for tourist traffic till Rohtang and beyond would take a lot longer. Since BRO not only has to widen the road and make it stable enough. It also has to clear enough snow at the top of the pass to make a parking lot for the vehicles traveling from Manali to Rohtang. All this work is expected to take a week or two, and in the meanwhile, BRO could reopen Marhi for tourist traffic. Work is also on to clear Baralacha La of snow and it is expected to be cleared of snow by the third or last week of May. Baralacha La is generally the last pass to open on the Manali – Leh Highway and once it is open, the route is reopened for vehicular traffic. In what can be easily termed an extremely disappointing news for Ladakh travelers, it seems Srinagar – Leh Highway would only be cleared of snow by the 15th of May 2017. Faced with higher than the usual amount of snow (around 40ft), BRO is having a hard time clearing Zoji La Pass of snow and has already missed multiple timelines this year. And if their new timeline of clearing Srinagar – Leh Highway of snow by 15th May is true, it means the highway might actually reopen by the third or last week of May for tourist traffic! Last year the Srinagar – Leh Highway had reopened for traffic on the first of May. And usually it takes third or fourth of week of May to reopen Manali – Leh Highway! This also spells bad news for internet connectivity in Ladakh, which was restored after a gap of a couple of months on the 31st of March. Only to go down a couple of days later due to heavy snowfall. Now the BSNL expects to restore proper internet connectivity to Ladakh, only after the Zoji La pass has been cleared of snow. 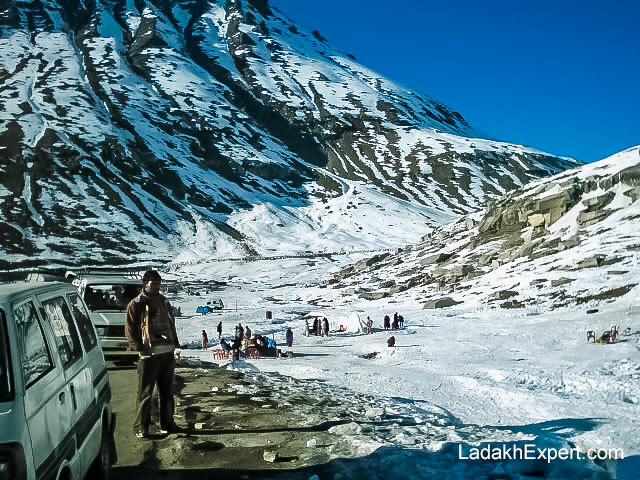 Until the Srinagar – Leh Highway and Manali – Leh Highway is cleared of snow and reopened for vehicular traffic, flights to Leh remain the only way to access Ladakh. Thankfully this year, the number of flights to Leh have been increased with Vistara beginning their operation from Delhi to Leh. BRO is hopeful of clearing the road to Rohtang Pass by tomorrow (21st April 2017). Having cleared the Rani Nallah glacier point, BRO team from Manali side is just a couple of kilometers before the pass and is hopeful of reaching there tomorrow. Even though this is a welcome news for everyone involved and BRO deserves a pat on the back for doing this arduous task. The reality is, it will still take more than a week or two for the vehicular traffic and in particular, tourist traffic to be allowed to reach Rohtang Pass. Until then, BRO would not only be working to ensure the road remains open, but also to widen the road sufficiently and check for the stability of the road, before allowing tourists through. BRO also needs to clear enough snow to make a parking lot for tourist vehicles visiting the high altitude pass. Locals though will be allowed through much before that. Since they desperately need to access medical and other facilities on this side of Rohtang Pass. Manali – Leh Highway is expected to reopen by May end or in the first week of June and work to clear Baralacha La has only just recently begun.